Stabilizers are evolving to enhance video shot on phones and action cams. Since the inception of photography, one of the basics of getting a sharp image has been to ensure that the camera is stable enough to minimize any unwanted blur from camera movement. Fast shutter speeds and tripods are typically the first choices to help mitigate such movement, and many of the automatic settings on modern cameras and smartphones (combined with built-in image stabilization) pretty much make camera movement blur a thing of the past. However, once we start using those same cameras to shoot video, camera movement becomes a creative necessity and must be handled in a manner that yields smooth video footage without a jerky and distracting appearance. While a camera’s lens or body may offer some internal stabilization, greater stability and controllability are needed to produce smoother, more polished movements and give us that “cinematic” feel. Luckily, there is a whole new crop of hand-held stabilizers on the market now that attach to your smartphone or camera and make it a piece of cake to let your inner Spielberg show. Throughout the busy aisles at the recent National Association of Broadcasters trade show in Las Vegas, you could hardly turn around without running into a booth that was promoting some type of camera stabilization device, whether for the smallest personal smartphone or the largest Hollywood blockbuster action cam. There’s an exploding market for cameras and supporting devices that take video to the next level by allowing viewers to experience scenes and locations in ways that were previously very difficult, if not impossible, to obtain with cameras of limited movement. 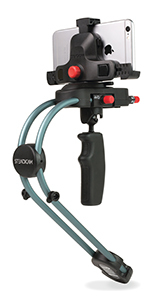 Hand-held stabilizers can be broken down into two broad categories: unpowered and powered. Most can be adapted to smartphones or small action cameras such as the GoPro. The simplest (and generally less expensive) unpowered version is basically a hand-held gimbal (pivoted support) attached to a curved rod with a counterweight at the end to dampen camera movement and allow for smooth motion. These often require practice to get movements just right, but once you get the hang of it some very smooth footage can be obtained. Since they naturally seek a balanced horizontal stability, they are somewhat limited in their up-and-down movements such as tilting up toward the sky or down to the ground. Powered gimbals, on the other hand, provide the ultimate in stability and controllability. The electronic brushless gimbals provide extremely smooth stabilization along multiple axes and have controls that allow for various modes of panning and tilting. New versions and iterations of stabilizers seem to be popping up on a monthly basis. By the end of the year we can expect to see hybrid versions from one of the larger manufacturers incorporating the rod-type counterbalance along with internal battery-powered gyroscopic control and Bluetooth connectivity for fine-tuning controls. Meanwhile, here are two well-made examples of currently available powered and unpowered models to use as a starting point in your search for the perfect stabilizer for your particular shooting needs. This three-axis smartphone gimbal stabilizer features a gesture control system and includes cradles for GoPros and small and large smartphones. 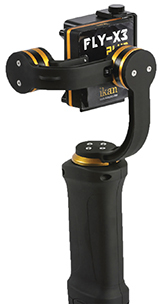 Ikan makes a full range of powered gimbals for other cameras such as mirrorless models and full-size DSLRs. From a well-respected name on movie sets around the world, the Steadicam Smoothee offers the renowned brand’s production quality in a handheld form. It is designed to work with cameras ranging from the GoPro Hero to iPod Touch devices, and offers a universal smartphone mount.